Now, it is possible! At SwissRidge, we are training a select few dogs to a high level of obedience before they ever leave our care. We informally call these “turnkey” dogs, because they come to you fully obedience trained and ready to fit seamlessly into your life. It’s a breeder’s prerogative to hold back a special puppy or two from a litter. Sometimes I exercise that prerogative by tucking a puppy away in my “Puppy Vault” to evaluate for my breeding program. Other times, we see that a puppy has such a promising personality that we decide to hold it back for six months or more of intensive training. socialized to different situations, people and places. While the level of obedience outlined above is more than adequate for most dog owners, Lucas is now planning to hold a few pups back and take them even further—to full off-leash leash obedience. If you are interested in an older, trained dog please contact us early with your specifications, as we now have a waiting list. When trained dogs are transitioned to your home, we will provide you with instruction on working with your dog. If you live too far from the kennel, you will receive videos and other supports, in addition to phone consults afterwards. You might worry that a dog six months of age or older may not bond with you as thoroughly as a young puppy would. Fear not! The testimonials below will put your mind at ease. After a few weeks with your beautifully trained ’doodle, you will both believe you were always together. I had been following the SwissRidge website for a year with ultimate envy for the Mini Bernedoodles. Unfortunately, I was not a candidate for adopting a puppy, as I was diagnosed with inoperable cancer in May 2013 and was beginning 6 months of chemo & radiation. My prognosis to live more than 2 years was dismal. But when Cleo came up under the older dogs for adoption & I saw she’d been trained for 8 months, it was as if an angel appeared! I had never had a large dog before & was not strong enough to train one, much less as a puppy. Still, I knew Cleo was my therapy dog, a future companion for my husband, and a goal to keep me going through the treatments and after. She has been all that and more! Cleo was trained by Mary, with help from Sherry and Lucas. Cleo was 10 months old when she arrived. She was gentle and loving, potty trained, crate trained, and knew all her commands, such as sit, stay, down, come, walk at heel, back-up, and wait. She never attempts being on the furniture, except for one patio ottoman that’s her perch. We live on a golf course & she quickly learned barking at golfers & maintenance workers is a no-no. With only 2 corrections, she adapted to my 14 lb., elderly Brussels Griffon who was not into roughhousing. Cleo treated her with respect & love. We are convinced that in training she was told she had a therapy mission and since day 1 she does not leave my side except for with Bob, who adores her & says she was the best decision we’ve ever made, in spite of the cost. Now, 6 months out of treatments, she has helped me get my strength back with daily walks on the golf course & has given me reason to surprise the doctors with my longevity! Cleo actually appears, instinctively, to sense illness and be drawn to a patient, as when she greeted another cancer patient (one of 10 dinner guests) with immediate acceptance, staying by her side or mine at all times. 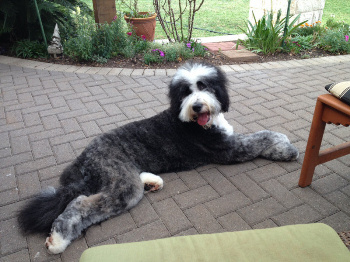 Annie is a Standard Bernedoodle that we purchased from Sherry when she was 6 months old and 60 pounds! She has the most amazing temperament, so sweet and gentle but still so playful and fun. We had never had a family dog before and we all agreed that we wanted a bigger sized dog to enjoy all our family outdoor activities together. One of the most important things for me if we were going to get a big dog is that it would be trained properly. Because I have never trained a puppy before and also our house is crazy busy with three kids and activities, I put in our application right from the beginning that we had wanted a puppy with a good solid base of training. 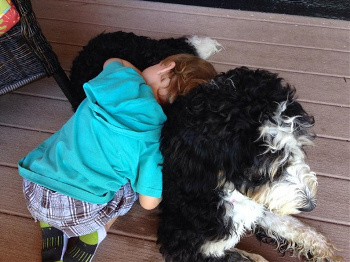 Our children are ages 2 – 11 so finding a gentle, loving, fun dog was so important. Annie is all this and so much more!! The training that Annie received from Mary as well as Lucas was the perfect start. Annie came to us with knowing all her basic commands, crate and house-trained, as well as being able to walk on a leash nicely without pulling. As much as we would all have loved to have been with Annie when she was a cute tiny puppy, we all agree that the few months she had with her trainers set her up for success and made her the perfect dog for us.